Did your dog’s breed originate in another country with a warmer climate? Dogs from warmer climates do not grow a thick, warm, coat of protective fur with an insulating underlayer, kind of like the down under duck feathers. These dogs are very, very vulnerable when the seasons change and colder weather moves in. Check with your veterinarian if you are unsure about whether your dog will need extra protection. Does your dog have short hair? Short-haired dogs like Greyhounds, Doberman pinchers can be affected by even mild temperature changes. They will likely need extra help staying warm. Watch carefully for signs that she’s cold when you take her outside. 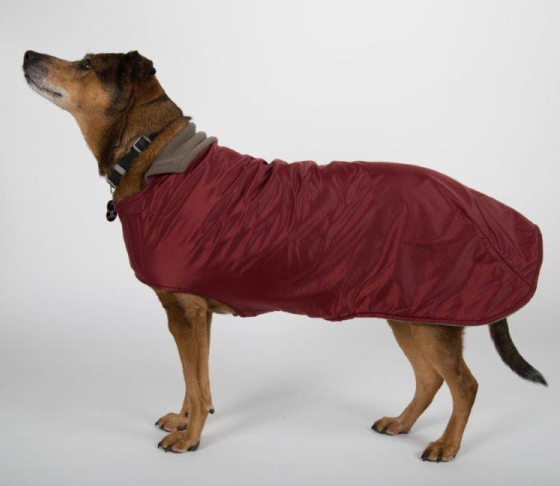 If your dog shivers, whines, slows down, stops walking or seem anxious she probably needs help staying warm and needs the extra warmth of a coat. Is your dog an elder? An older dog might require extra warmth (just like an older person) especially if he has a health condition such as arthritis which can make joints tender and painful. Heart disease, kidney disease or hormonal imbalance can make your dog more sensitive to colder weather. A very young dog might also be sensitive to colder temperatures. Has your dog recently been hospitalized or had surgery? Dogs recovering from any illness are using lots of energy to heal. It may be more stressful to their system as their bodies try to withstand the demands of cold weather. Do you live in a very cold area? The hours after the sun drops can be much colder and challenging for your dog. Domesticated dogs who live indoors don’t develop the heavier coats of those who live outside. Travel/Vacations. Do you live in a warm climate? Your dog will need help staying warm if you’re planning to visit a colder state. *During rain and snow storms. *At night when the temperature drops.